Tucked away beneath the railway arches a stone’s throw from Southwark Station is Origin Coffee’s latest London venture. The interior has been designed by Anna Hart at Hart Miller Design and features a selection of vintage industrial pendant lighting by skinflint throughout. It is Origin’s second dine-in space following the opening of their next Cornish outpost 'The Warehouse' next door to us here in Penryn earlier in the year, also featuring our vintage industrial lighting. This time, the space is a beautiful backdrop to enjoy all things Origin: expertly roasted and ethically sourced speciality coffee, alongside delicious food, coffee merchandise, and a training space for Origin’s educational and technical offering. Retaining the sense of space this created for the cafe this has been balanced with creating a more intimate dining environment, ‘a great place to hang out; drink coffee and enjoy food’. Suspended in the window are skinflint’s mottled conical Eastern Bloc pendants from the 1950s, catching the eye of passers-by while simultaneously providing illumination for the banquette window seating inside. 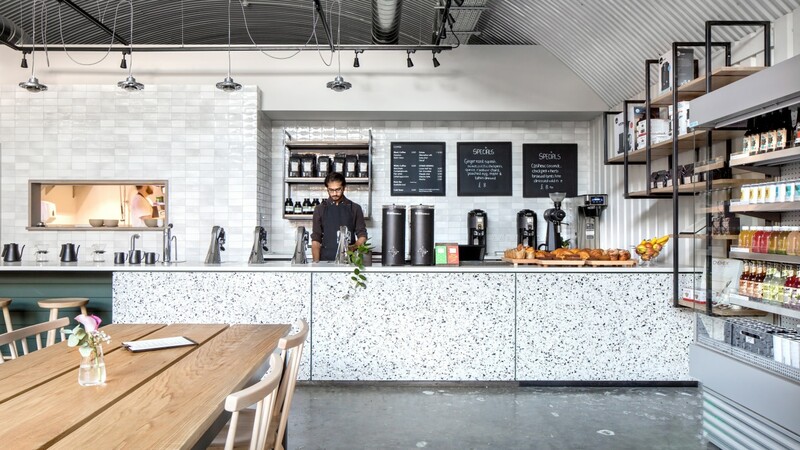 Elsewhere above the counter are four of skinflint’s 1940s airfield taxiway lights, originally installed in the taxiway of an RAF base in Northwest Wales; their aircraft-scarred aluminium housing complementing the sleek coffee taps below. Meanwhile, in the training space, a Soviet Era industrial pendant salvaged from a factory in the former U.S.S.R. provides statement lighting over the table; it’s two-tone green enamel shade also lifting the framed coloured pictures on the wall. A run of glass and aluminium naval bulkhead lights from the 1950s also illuminate the hallway to the bathroom.